Many women will agree that there is a definite lack of serious riding apparel in the moto-universe. Those that do exist are often guy-styled garments that are re-cut to fit women, or worse yet, a fashion statement with no real function. Alpinestars steps in with a clear alternative to these lesser options, combining the 'look' and the workmanship to provide real value to women on two wheels. You may have taken notice of the Alpinestars Vika Jacket that hit the shelves this past fall. If you have been searching for the perfect pair of boots to accompany this, look no further! 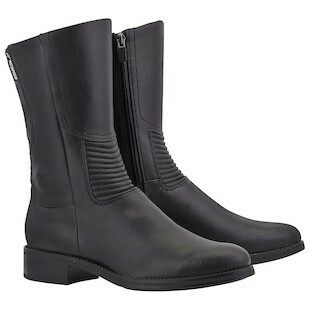 The Alpinestars Women's Vika WP Boots are a muted style option constructed with a suede and leather outer. The protection is integrated into the heel and toe and the boot also conceals shin and ankle inserts into its graceful lines. Fully waterproof by means of an inner membrane, the Vika are designed to keep you dry without looking overtly moto-specific for a sophisticated combination of fashion and function. Accordion stretch panels promote ease of use both on and off the bike. 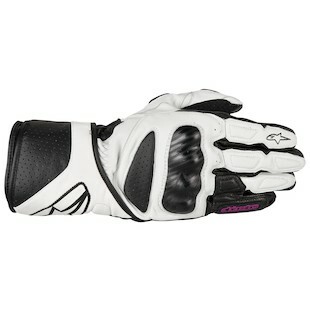 Lets shift focus to your other appendages and talk about the Alpinestars Women's Stella SP-8 Gloves. A much needed refresh of their 2009 SP-8 gloves, Alpinestars updates these with confidence and a bold new style. While the protection has not noticeably changed, the fit has been updated with more accurate female contouring. A narrow fit also keeps adequate finger length and is adjusted cleanly at the wrist for the ability to wear over or under your jacket. In addition screen-printed logos reduce weight slightly and remove unneeded stitching from the leather. 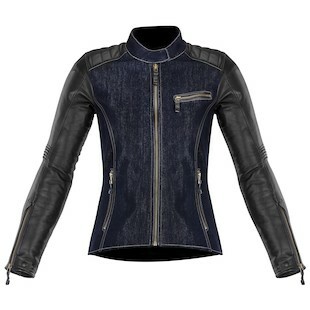 Last, but not least, the Alpinestars Women's Renee Jacket drops in just under the Vika leather price point. A lighter textile shell made from an indigo denim allows for a more casual fit. However, leather is still used along the outer arms, shoulders, and sides so as not to compromise on protection in a sticky situation. Also available in a bronze color named "Champagne", the Renee Jacket is a great form fitting option with full armor protection as well as an internal pocket for back protection.